Bob Bastey, owner of Bobs Kozy Korner Store in Orrington, celebrates with Thomas Pelkey, 10, and congratulates him on the deer he shot on youth hunting day Saturday. At left is his father Donald Pelkey and at right is Lee Kantar, DIFW moose biologist. 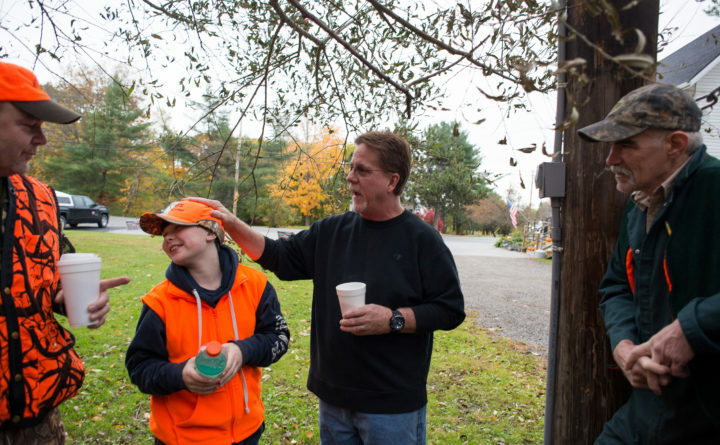 ORRINGTON, Maine — Thomas Pelkey, a 10-year-old fifth-grader, showed up at the local tagging station on Saturday morning as an “old” veteran of the Youth Deer Day scene. As they say, he’s even got the hat (and rifle) to prove it. 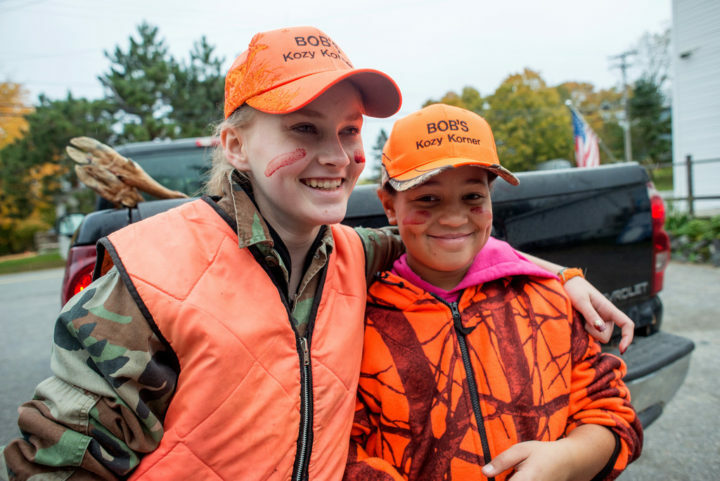 For the past 13 years, Bob Bastey, the owner of Bob’s Kozy Korner store, has offered young hunters who tag a deer at his establishment a guaranteed prize, and a chance at a bigger reward. 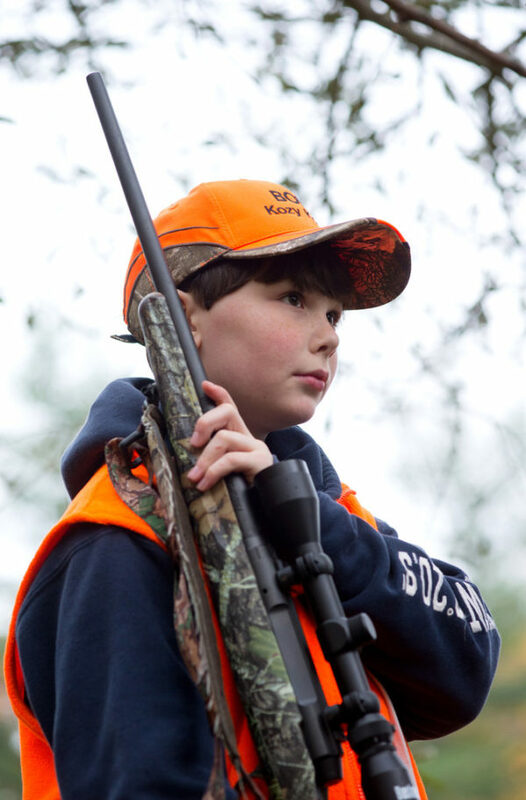 Every youth hunter gets a hunter orange “Bob’s Kozy Korner” hat upon registering a deer. And at the end of the season, one lucky youth walks away with a .243 Savage hunting rifle. “We wanted to get the kids involved again. Get them out in the woods with their parents, uncles, aunts, brothers and sisters. To just be part of it,” Bastey said. On Saturday, Pelkey showed up wearing one of those hats. And he shot his 5-pointer with the .243 Savage he won in the 2016 drawing. Thomas Pelkey, 10, of Orrington, watches as his dad weighs his buck at Bob’s Kozy Korner in Orrington on youth hunting day Saturday morning. Thomas shot his 101 pound buck with the Savage .243 rifle that he won in the youth hunting day raffle drawing at Bob’s Kozy Korner two years ago. For the last 13 years, each youth that tags a deer at Bob’s on youth hunting day gets their name put in for a rifle drawing. Hunting with his dad, Donald Pelkey, Thomas wasted little time filling his tag, shooting the 100-pounder less than an hour after legal shooting time. The buck was following a parade of four does, and Thomas said he had to wait for it to walk across a field before a good shot presented itself. And the more Thomas saw of the deer, the bigger it got. “We thought it was a [3-pointer] at first. My dad had binoculars and he said, “It’s a 3-pointer,” he said. “Then I got closer to it [after shooting it] and it was a 4-pointer. Then I picked up the antlers and it was a 5-pointer. Apparently, Bastey’s effort is paying off. “I’ve been told if you show up at school with an orange hat from Kozy Korner they know you got a deer,” Bastey said. Maine’s Youth Deer Day began in 2002, and offers young hunters the chance to get a head start on the season while hunting with non-gun-toting adult mentors. It has been a smashing success that has created memories for countless youngsters and their families. Thomas Pelkey’s deer was the third of the day tagged at Bob’s Kozy Korner Store, but he didn’t even win “earliest deer” honors for his fifth-grade class at Center Drive School. That prize — if there is one — went to 10-year-old Grace-Lyn Holloway, who arrived at the tagging station with the first deer of the day just before 7:30 a.m.
Grace-Lyn Holloway, 10, (right) celebrates her first deer with her step sister, Marissa Grover, 13 (left), on Saturday morning. Grace-Lyn was the first kid to arrive at the tagging station at Bob’s Kozy Korner in Orrington on youth hunt day and her step sister Marissa was the first to tag in there last year. Grace-Lyn’s doe weighed in at 122 pounds. Holloway’s mom, Carrie Grover, said Grace-Lyn didn’t need a wakeup call at 5 a.m. Mom was eager, too, and said she’d been awake since 1:48 a.m.
And after a 2017 hunting season that included no deer (but plenty of squirrels), Grace-Lyn wasted no time in changing her luck. “We walked in the field and there were bucks everywhere,” Grace-Lyn said. “Blowing at us,” Grover clarified. Grace-Lyn’s hunt was over early, but the work wasn’t. Her family owns a deer-butchering operation, and she knew exactly what would happen after they left the tagging station. “We’ll go home and cut it up, and put it in the freezer, and eat it,” she said. Her family is building a solid Youth Deer Day resume, as Grace-Lyn’s step-sister, Marissa Grover, arrived at Bob’s Cozy Korner Store with the site’s first deer on last year’s youth day. The biggest deer early on Saturday belonged to 15-year-old Nathan Wade of Hampden, who was hunting with his father, Dan Wade, and family friend Anthony Howard. Nathan shot his first-ever deer, an 8-point buck that weighed 177 pounds, field-dressed.